My Honda Civic Hybrid '04 with 88,000miles showed check engine light recently. I have a reader and it shows error code P0134 (02 Sensor Circuit No Activity Detected). Also, this winter there was a rusty bit of metal that fell off from that I think is the catalytic converter - looks like the top part of the enclosure. It seems like these two events are connected. I am planing to buy a new car in a couple of months. Can I keep driving a little longer? Is anything worse going to happen other than some more pollution and poor fuel efficiency? You could trash the catalytic converter (big bucks). You’ll need to fix it before you sell it anyway so do it now. P0134 is for bank 1, sensor 1. So, it is the important one. Driving without fixing it can cause all kinds of problems. O2 sensors are pretty robust, so I expect it will turn out to be a wiring or connector problem rather than the sensor itself. Thank you very much. I’ll have the wiring checked. I live in NYC and there is lots of salting in the winters. Judging from the rusty bit that fell off, probably some of the wiring rusted as well. By the way sometimes when I drive in the highway the Check Engine light goes off. Could it be that the wind is pushing the wires around and they are reconnecting at times? 88k miles is a little bit early for an O2 sensor failure, but it is in the zone and city driving like NYC may contribute to early failure. So I am going with the sensor and not the wiring. The reason that the MIL (check engine light) might be going out from time to time is that the sensor is on the edge of failure and from time to time, it works good enough to turn off the light, but soon it comes back and pretty soon it will always fail. Wiring failures are sudden and don’t self repair. Even if the wind were blowing the wires around and causing an intermittent connection, it would not last through the three good drive cycles needed to turn off the light. I don’t know NY laws, but some states require the car pass all emissions and safety tests to complete the sale. It may be different if you are trading, the dealer may be responsible for the repair, but if that is so, it will probably degrade the trade in value more than the cost to repair. After the repair, you need a number of drive cycles before the computer will set all the ready lights, so a last minute repair won’t help. Do it now and save on gas between now and the time you sell. Thank you everyone. I will try to do this myself. First just to make sure… This is the bank 1, sensor 1, correct? 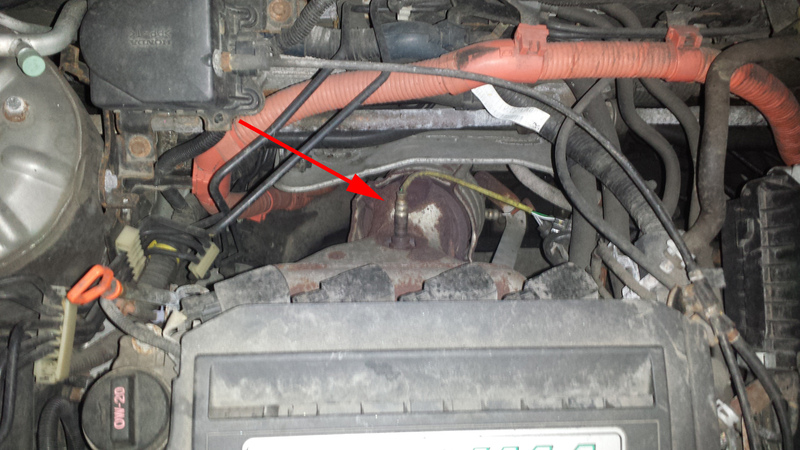 I’m betting that chunk of rusty metal was the catalytic converter’s heat shield, which sits overtop the cat. I would also bet that as it fell off the car, it banged into the sensor wire and pulled it out of the sensor - not enough to be visible, but if you tug on that wire I wouldn’t be surprised if it popped out. That’s the secondary sensor. The primary sensor screws into the exhaust manifold, forward of the heat shield. I don’t know if any of the less expensive models would substitute for P/N 36531, Read their comments sections. I don’t think any Bosch sensor would substitute on a Honda Civic Hybrid. The sensor in the picture is screwed into the exhast manifold, forward of the heat shield… I’m not sure what you’re driving at. But if you’ll look at the wire, it goes off to the side, where the heat shield might get bounced if it falls off while you’re driving. Yeah, for that price, try unplugging and replugging it a dozen times to see if it reconnects. You may have to put a few drive cycles on it (engine start - run - drive - stop - engine stop - key out) before the computer recognizes it’s fixed. That is what I’m driving at. Get real. You’re going to need a new A/F sensor. Best bet is to take it to an indie and ask them to fix the DTC at the lowest cost possible. Second best bet is to buy the Honda P/N and DIY. Last bet is to take it to a Honda dealer; they will fix it but it will cost you, especially in NYC. That is what I'm driving at. Get real. Are you always rude as hell, or are you just having a bad day? LOL, sorry to have offended you. I’m only trying to help the OP. He really needs a new O2 sensor. He should bite the bullet and buy the OEM Honda/Denso sensor. He won’t find a substitute guaranteed to work. I’ve been down that road, and I am a couple $100 short because of it. There may be a cheaper substitute for the OEM sensor, perhaps made in Kuala Lumpur or some such place and selling for $39.95, but I am not aware of it. That is why I recommended he see an independent shop to get the lowest cost on a generic sensor. Well, I’m German, and I guess we don’t have the sensitivities Americans have. No slight intended, hope no slight received. With such special items as O2 sensors, I would not compromise on quality. I would spring for the factory unit. Having lived in Kuala Lumpur for 5 years and having experienced some of these unapproved after market items, I remember car batteries that lasted less than a year, spark plugs that needed to be replaced every 10,000 lkilometers, and cell phone batteries for my Siemens cell phone that lasted only 6 months. I recently purchased a Denso O2 sensor for my early 90’s Corolla and it was only $65. I wonder why the Honda sensor costs so much more? As I recall there are two kinds, one is just the basic O2 sensor, which switches on and off when there’s too much O2 or not enough O2. The other is an air/fuel mixture sensor where the output is proportional to the air/fuel mixture. My Corolla has the first kind, and maybe the Honda has the second kind. That’s the only way I can think of for the price difference , $400 compared to $65. Yep, Honda’s is the second kind. My brother, visiting his daughter in Thailand, said if you cut open a ‘D’ dry cell battery there, you find a ‘AAA’ inside.